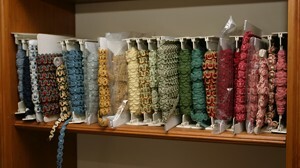 All trimmings are available in a vast selection of colours. Please send a sample of your fabrics and we can suggest a matching shade. Sold in whole metres only. Right: just one shelf of the vast range of trimmings we can call on. ¼in dia for use in Antique work. To be hand sewn. Please send £1 for colour catalogue showing the range of above. Red, green, light tan, dark tan and black. per metre or 25 metre roll. Please supply 2in sq of your fabric and quote which size and back required.